Cassoulet, the easy way serves 6-8 Originally the cassoulet originated in the South of France and was named after the traditional earthenware pot, a casserole vessel that was used specifically for it. It was a “peasant’s” dish and utilized all sorts of left-over’s. It was a slow cooking dish that traditionally contained pork, sausages, goose, duck, mutton, pork skin and white haricot beans. But it has transformed itself by cooks worldwide to now even containing fish. This is such a versatile dish and it can be quite healthy. It can be a little time consuming due to the chopping of the veggies and the browning of the meats so give yourself a minute or two to this creative dish. The end result will be well worth it. Also, if you wish to vary the meats such as using pork, go for it. The fun thing with this dish is that you can make it your own by using your imagination with many different kinds of variations. Bacon-chopped about 1/4 cup or so. Seasonings: use as you please and pinches only: all spice, cardamom, coriander, nutmeg, paprika, cayenne, cloves, ginger, nutmeg, a pod of anise. Place all of your meats in a separate bowl—if you wish you can S&P them. Place your finely chopped shallot, onion and garlic cloves in a small bowl or maybe like I did you’ve made it easy for yourself and used your Cuisinart. Open your chopped tomatoes can and remember the 2 tablespoons of tomato paste. Drain and rinse the cannellini white beans and place in a bowl. Heat the skillet over medium heat and cook the bacon in it (about 5 minutes). When the bacon is done, scoop the bacon bits out but leave the bacon drippings in the pan. Over medium heat, add 2-3 tablespoons of olive oil to the bacon drippings and gently sauté the onion, shallot and garlic (about 5 minutes) till softened. Remove the ingredients to a separate dish. Now, still over medium heat, add to the skillet the chopped veggies and sauté them till slightly brown—stirring every now and then. Remove the veggies to its separate bowl. Remove the meats to its separate dish. Over medium heat in the skillet add the chopped tomatoes with its liquid, the tomato paste, the onion, garlic, shallot and 2 cups chicken broth and bring to a slight boil. Add which ever spices you like tasting as you go. Add the white wine or vermouth. Keep on tasting. Add the herbs. If you like the sauce—go for it. At this point add the beans, meats and veggies. Now if you need some more liquid add some more stock but you don’t want the mixture to be drowning in the liquid. If you have too much liquid, spoon it out. Place the whole skillet, UNCOVERED, in the pre-heated 350F oven and bake for 1 hour. Watch every now and then to see that your liquid has not evaporated. If so, add some more chicken stock. Serve with crusty French bread and wine of course. This is a German inspired dish. It’s called Eisbein in Northern Germany and Schweinshaxe in the southern part. My inspiration is not totally authentic because I’ve added more root vegetables to it; for fall time cooler weather this is a perfect dish. It’s nice to serve for the family and even guests. Not only is it quite healthy, but it’s also super economical. The dish shown here cost me $13 (including the sauerkraut and optionals) for 3 generous servings. And that cost is here in the Sun Valley, Idaho region where prices are a bit more than in other lower lying areas. If you wonder from where the “hock” comes, let me tell you: it’s the part of the pig where the foot was attached to the leg. Serve with separately heated sauerkraut and if you didn’t use the potatoes in the dish, those can be cooked separately and served with the “kraut” and the hocks. In a roasting pan that you can easily cover, spread the onion, celery, garlic cloves and leek on the bottom. Place the pork hocks on top of the veggies and pour the olive oil over the hocks and pepper and salt both sides but make sure the hocks are rind side up before placing in oven. Place in 425 oven and bake for about 25 minutes or till the rind is crispy. Remove the pan from the oven and turn the oven down to 350. At this point of the recipe, I did check every half-hour to make sure the stock had not totally evaporated. If so just add more. Also you can baste the meat every half-hour. Probably all of the stock has evaporated which mine did; so add 2 more C. of beef stock. Add the juniper berries or fresh lemon juice and rosemary sprigs (or gin), the 2 cinnamon sticks and bay leaves. I also added the optional parsnip and turnip at this stage. Cover and bake for 1 hour. Then add the optional potatoes, carrots and Brussels sprouts. You might need more beef stock at this point so add another cup. Cover and bake for another hour or until the meat is easily removed from the bone. However, don’t over cook or the hook will become tough. Skiing on Big Game Day in Sun Valley is usually superb because you mostly have the mountain and trails to yourself. The rest of the folk are prepping the chicken wings, guacamole and wondering about “flat footballs”. You’re on your own for the chicken wings but here’s a little help for the Guac and believe me that will NOT be flat. Frankly, I like a good tasty strong Bloody Mary to go with any one of these recipes—but if beer, wine or a margarita is your preference, go for it. And just in case you’ve bought too many avocados, next week I’ll have a nice little breakfast oven baked avocado/egg recipe just so those extra avocados won’t go to waste. It’s easy, delicious, healthy and not flat either. 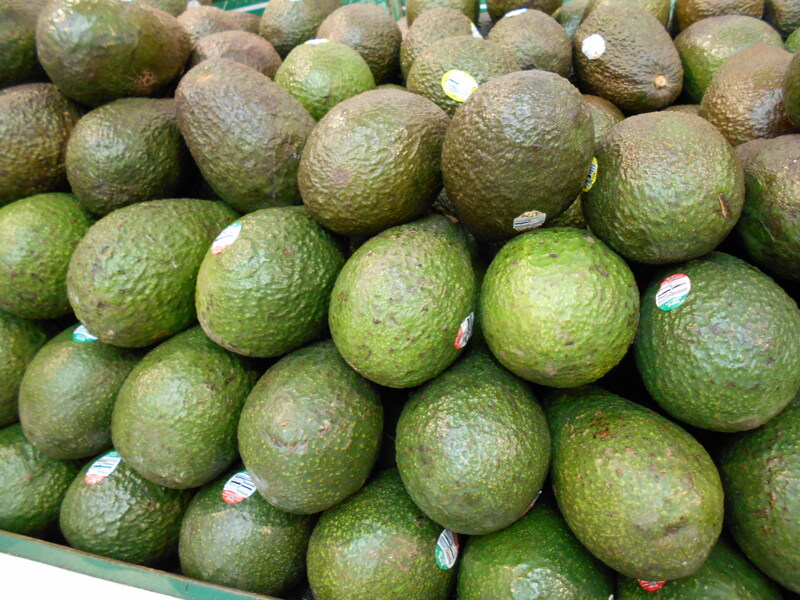 Slice avocados in 1/2; remove the seed; spoon flesh into a medium sized bowl. Using a fork, mash the avocados until the consistency of your desire has been reached. 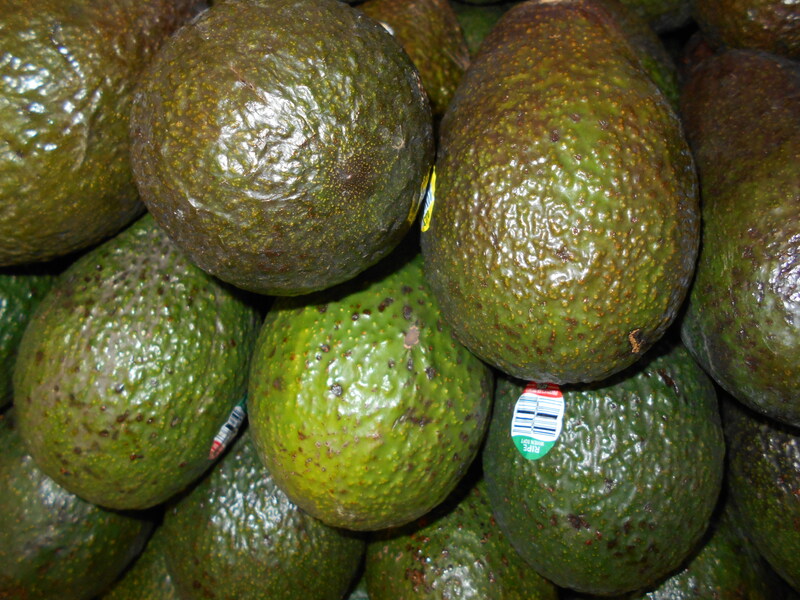 If you wish a rougher chop, use a knife to slice through the avocado flesh and then a fork. 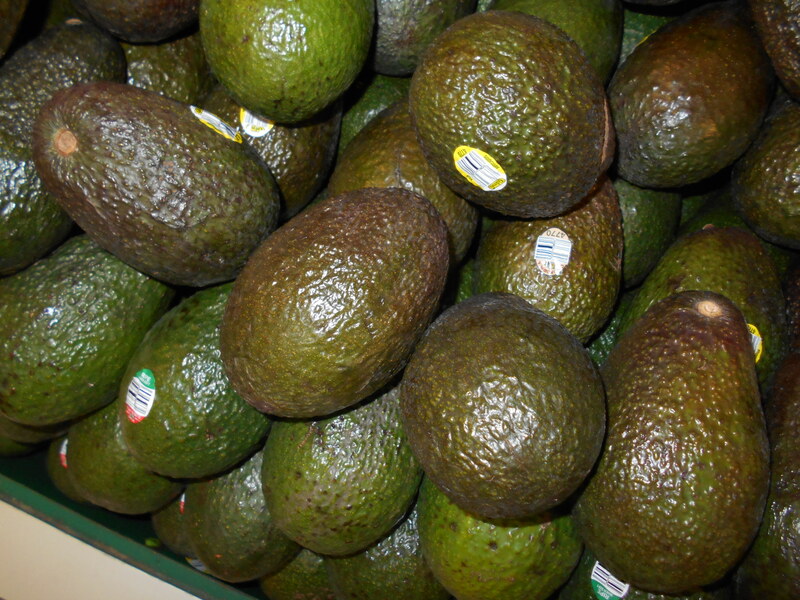 And you might add the lime juice to the pulp to start with so that the avocado doesn’t brown. Fast and Dirty: In place of the tomato, cilantro and red onion, stir in 1/2 C. of your favorite jarred salsa, 1 Tblsp. olive brine and 2 Tblsp. chopped green olives. Mango-Balsamic: In place of the tomato, stir in the diced flesh of 1 mango. Use scallions in place of the red onion and 1 Tblsp. balsamic vinegar in place of the lime juice. Tzatziki: Use 1 C. finely diced seedless cucumber in place of the tomato and red onion. Use dill in place of the cilantro. Stir in 2 minced garlic cloves. Roasted Garlic and Poblano: Roast a head of garlic wrapped in foil with a little olive oil until tender and brown, about 30 minutes at 400 F. Roast a poblano pepper under the broiler, turning frequently, until the skin is charred. Carefully remove the charred skin from the pepper (with gloves maybe), then chop the flesh. Squeeze the garlic pulp from the skin and mash. Mix both into the guacamole, omitting the onion. Minted Cotija: Follow the basic recipe but add 3 Tblsp. chopped fresh mint instead of the cilantro and add 2/3 C. crumbled cotija cheese. Season with S&P. Maple-Bacon: Follow the basic recipe but use 3 avocados, 2 Tblsp. white wine vinegar, 2 Tblsp. soy sauce, 2 Tblsp. maple syrup, 2 chopped scallions and 1/2 C. chopped cooked bacon. Season heavily with black pepper. Ginger-Hoisin: Add 2 Tblsp. grated fresh ginger and 2 Tblsp. hoisin sauce to the basic recipe. Citrus Tabbouleh: Replace the tomato and onion with 3/4 C. purchased tabbouleh and the zests of 1 lemon, 1 lime and 1 orange. You can also add 1/3 C. pomegranate seeds. You’ll love the color of this version. Shrimp Scampi: Use lemon juice in place of the lime juice and basil in place of the cilantro. Omit the cumin, tomato and onion. Stir in 1 C. chopped cooked shrimp, 2 cloves minced garlic and 1/3 C. shredded Parmesan cheese. Pico de Gallo Guac: add 1/2 C. of chunky tomatoes, 2 Tsp. of minced jalapenos and 2 Tbsp. of chopped green peppers to the basic recipe. Don’t like green pepper, choose the milder red, yellow or orange one. Calorie Conscious Guac: Delete one of the avocados and add 1/2 C. of LIGHT sour cream or LIGHT plain yogurt. Here you’ll have a creamy and fluffy guac minus some calories. You may like to do this even with 2 or 3 avocados because it’ll be a bit different. Greek Guac: Add 1/4 C. of chopped Kalamata olives and red peppers and instead of the cilantro and lime, add basil and lemon juice. Guac in those little peppers: Yes, you know those cute little peppers in all colors, all ready in a package. Serve a tray of those, cut in half and filled with your favorite Guac. Fun, easy and colorful. And you still can have chips and drinks on the side. Got some left over veggies in your frig.? Or even some very fresh ones? Even lettuce? Yes, lettuce!!! Try it and you’ll see. Well, I did and before they went south, I made myself a delicious and very healthy soup. I also decided that I wanted to pair it with some hot Saki to warm my cold bones after a delicious day cross country skate skiing Hailey’s Croy Canyon, which by the way was perfectly groomed as usual by the BCRD. Well the moose was out and about, or so I was told by a youngling, but I didn’t encounter it. I have had one of the moose twins (yes indeed) in my front yard whereas after it, along with its brother and mother, sauntered down Hailey’s main street. Now, we do know don’t we (? )that here in Hailey territory when we see the moose(s) we don’t go up and give it(them) a hug or let the dog do that either. Now I bet you all wished you lived in Hailey to see our magnificent wild life. But I digress and back to the soup—I am going to tell you how I made mine, but my fun in cooking is inventing dishes so here’s one that you can invent for yourself. Then, when you’ve made a really awesome concoction, be sure to email me and then I’ll post it on my eyeonsunvalley.com post. When you do this, imagine yourself becoming a famous chef because yes indeed, EOSV can help you become that. Brown the chopped veggies over medium low heat (10-15minutes) in the melted oil/butter till they are soft but not browned. Add the stock, lime juice, Inglehoffer, Worcestershire and S&P to taste. Slow simmer for 45 minutes to 1 hour or more adding more liquid stock and seasonings of your choice if needed. 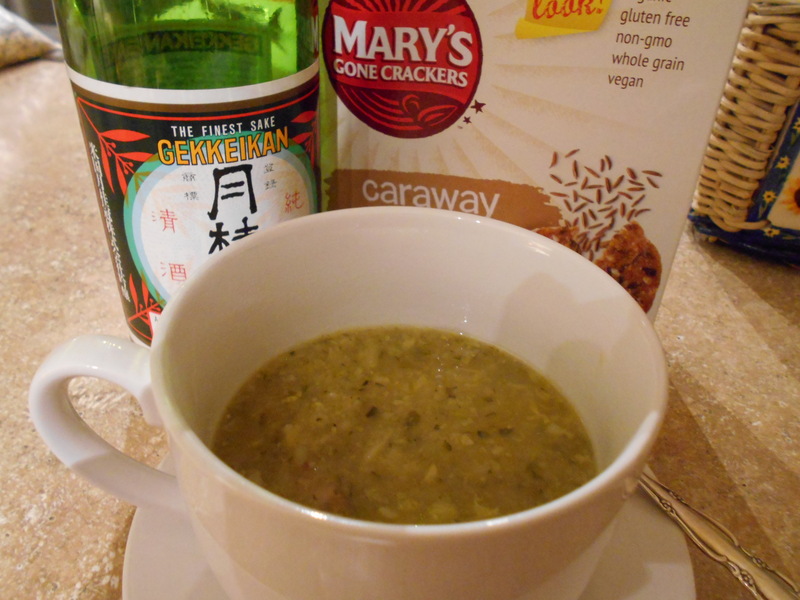 Result: This soup was easy to make, comforting and hot. I knew that it was healthy featuring all those veggies and I topped it with gluten free self-crunched caraway crackers that made it even more delicious. My treat to go with this dish was some nice hot Saki. Now use your imagination. You can make similar soups with a German bent, Indian bent, French bent—well, you get the idea. Now that it is the New Year and we all wish to scurry away those extra pounds but still remain within the healthy diet realm, here is a recipe that you’ll love eating yourself and serving to others. At the market today eggplant and shoulder lamb chops were on sale—so of course this led me to salivating for a good Massouka. In my estimation, this is not an absolutely gorgeous dish to view, even when plated, and I do like aesthetically pleasing dishes to serve. However, it’s so good to eat, particularly when you make it the time consuming way, that I have forgiven its looks. I prefer it without sliced potatoes, however, it’s good with as well. I add instead of potatoes a yellow, orange or red sliced pepper and 2 zucchini sliced. I also used my processor for most of the chopping, etc. They come in so handy! I serve it sided with a crusty loaf of French bread and a nice light salad. And for desert, it’s fun to have some fresh cut up fruit along with Greek yogurt. So, when you have a minute to spare, do give it a try. Also remember, you don’t have to follow the amounts of the ingredients exactly—it’s a very versatile dish and you can alter and make it just to your very own taste and liking. 1 large eggplant-slightly peeled—leave strips of peel about 1 inch wide in-between peeled sections and slice in 1/2 inch slices. 1 C. (or more if needed) plain bread crumbs placed on one plate for secondary eggplant dipping plus save some extra bread crumbs to place on the bottom of your final baking dish. 1 lb. shoulder lamb chops if you can’t find ground lamb in the store. Remove meat from chop bone and grind in processor. You can use ground beef but honestly, I love the lamb flavor in this dish. In a large and deep pot (but you can use a sauté pan), brown the lamb until the pink color disappears. Add onion and mushrooms and sauté until translucent, about 5 minutes. Add the garlic and sauté for about 1 minute or till fragrant. Add the wine and simmer until it reduces a bit. Add the spices, parsley, tomato paste, 1/2 C. crushed tomatoes and sugar. Allow the sauce to simmer on low uncovered for about 15 minutes so that the excess, if any, liquid disappears. It should look like a chunky tomato sauce. Season to taste with S&P. Now taste some more and see if you want to add some more cinnamon and allspice. Liberally salt each eggplant slice on each side and place them in a colander with a plate on top. Then place a heavy can on top of the plate. Let the eggplant slices sit and weep for at least 15 minutes but better if you can wait an hour. Place aluminum foil on a large cookie sheet and oil it. When the eggplant slices are ready, wash each slice and pat dry it with a paper towel. Then dip each side of each slice first in the egg whites and then in the bread crumbs and place on the cookie sheet. Bake the eggplants for 30 minutes but at 15 minutes, turn the egg plants over to the undone side. When the eggplants are done, turn the oven down to 350 degrees. Melt butter in a skillet over low heat and using a whisk, add the flour to the melted butter whisking continually to make a smooth past. Allow the flour to cook for a minute but do NOT allow it to brown because otherwise it won’t be béchamel sauce; it’ll be brown sauce. Add the warmed milk to the mixture in a steady stream, whisking continually. Simmer over low heat until it thickens a bit. WATCH CAREFULLY. Take the skillet off the heat and slowly whisk in the egg yolks and a pinch of nutmeg. Return to low heat and keep whisking until the sauce thickens. In a well oiled large round (10” or 12”) Pyrex dish, sprinkle the bottom with breadcrumbs. You are going to make at least 2 layers but it can be even three—so divide your ingredients accordingly. Leaving about 1/4″ space around the edges, place a layer of all of the potatoes if you are using them and if not, then start with placing a layer of sliced eggplant, then some of the remainder of the 1/2 C. of crushed tomatoes, and then the zucchini and pepper, then some of the meat sauce, then some cheese and so on except be sure to save some cheese for placing on top of the béchamel sauce. Then pour the béchamel sauce over the eggplant and be sure to allow the sauce to fill the sides and corners of the dish. Smooth the sauce on top with a spatula and sprinkle with the remaining cheese. Bake in the 350 degree oven for 45 minutes or until the béchamel sauce is a nice golden brown color. Allow to cool for 15-20 minu8tes before slicing and serving. This dish can be refrigerated and made ahead up to when you place the béchamel sauce. If you do that, let the dish come up to room temp and make the béchamel sauce right before baking. I love fresh salmon and when I find some well priced, I buy it immediately. I was really lucky to have found this King Salmon for the same price as the North Atlantic variety–$6.99/lb. What a deal!!!! 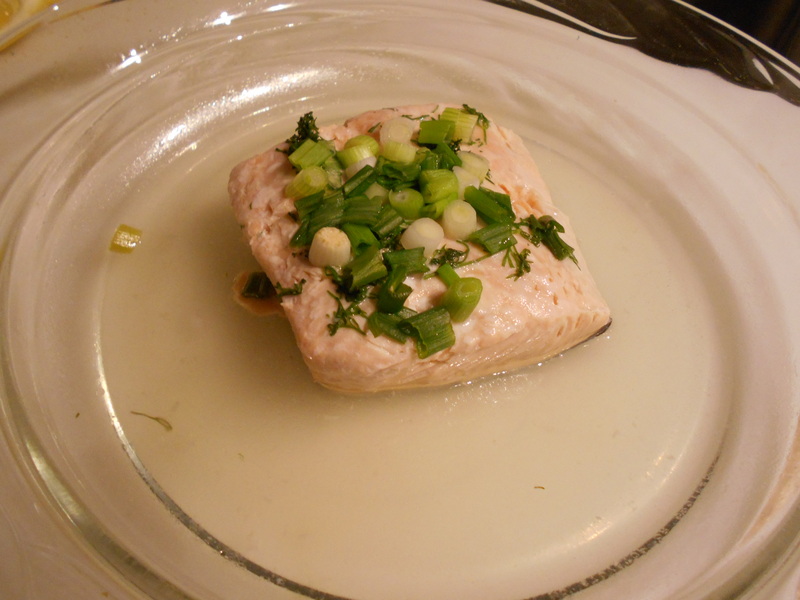 I have many recipes for salmon but there are two which I prefer: oven roasted and this recipe which is oven poached. Both are simple and easy to prepare yet make for a very elegant looking and tasting dish. As such it is a fine one to serve for guests. I many times serve my poached salmon with couscous or roasted fingerling potatoes (see my blog for vegetable roasting recipes) as shown in the third food picture above; they took about 20 minutes to get done in the 450 oven so see how easy this dinner can be because you can roast them during the same time that you oven poach the salmon. Sometimes I’ll serve this dish with our wonderful Hagerman fresh corn which I so easily cook in the microwave (see my blog for the easy recipe). For the greens I really love making my Lemon Lovers’ Asparagus recipe (also found on my blog) which features roasted asparagus and freshly cut and roasted lemon slices. You can use any kind of nice looking and fresh salmon fillets but the King Salmon makes for a very fine dish indeed. You can roast fewer fillets or more so for instance for one fillet in a smaller baking dish, I reduce the specified amounts of wine, water, etc. mentioned below to 1/2 of what the recipe calls for. As well, because my fillet (shown in picture) is one luxurious inch thick and measures 4” X 4”, it took about 13 minutes instead of 10 minutes to poach. So, take this all in consideration if you poach fewer or more fillets and as well as to the thickness and size of each one. The trick here I think is to keep a close eye on it all. You definitely don’t want an overdone fillet. Lastly, this is a dish that does not have to be steaming hot when served. It is fine served at medium hot temperatures or even at room or cold temps. In conclusion, I think that this is an easy meal to serve for just yourself or for a crowd of people without sweating the preparation because actually you can make it well before you serve it and serve it at room temp. Four 6-8 oz. salmon fillets with the skin. I lift the salmon off the skin with a metal spatula. For 4 filets, use 2/3 C. white wine or white dry vermouth. Adjust the amount for less or more filets. Pre-heat oven to 450 degrees F.
Place the fillets, skin side down, into your dish. Pour the wine and water over them, season lightly with salt and sprinkle the 1 Tblsp. dill and the scallions on top. Cover the dish tightly with aluminum foil and place in the preheated oven. Bake until just cooked through and flaky usually about 10 minutes however, if your fillets are quite thin, you might check after 5-7 minutes. Be sure not to cook them too long. Even if they look a bit underdone, remember, they will cook a bit longer when out of the oven. In a small bowl place the above ingredients and stir well. I place a generous dollop of the sauce on top of the salmon, but if you wish you could pass the sauce around and let people serve themselves. 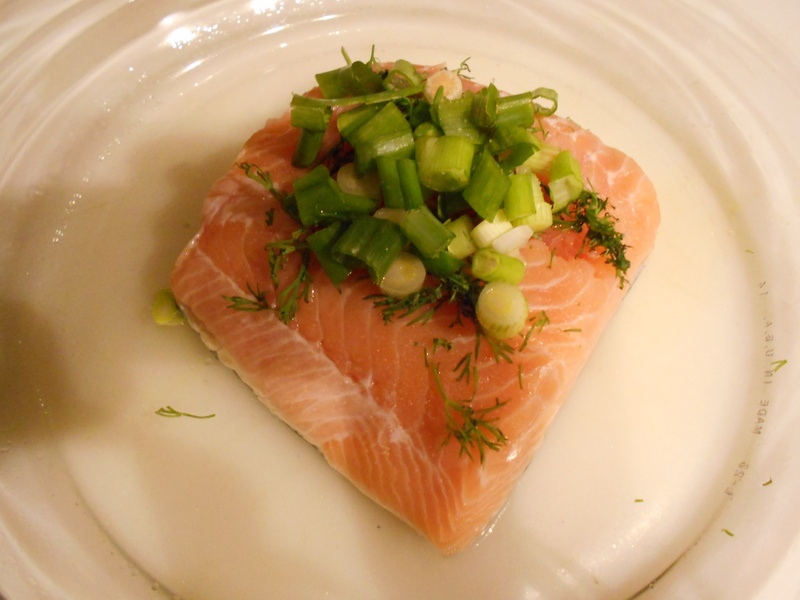 In that case, I do put some extra chopped fresh dill on top of the salmon for the presentation. 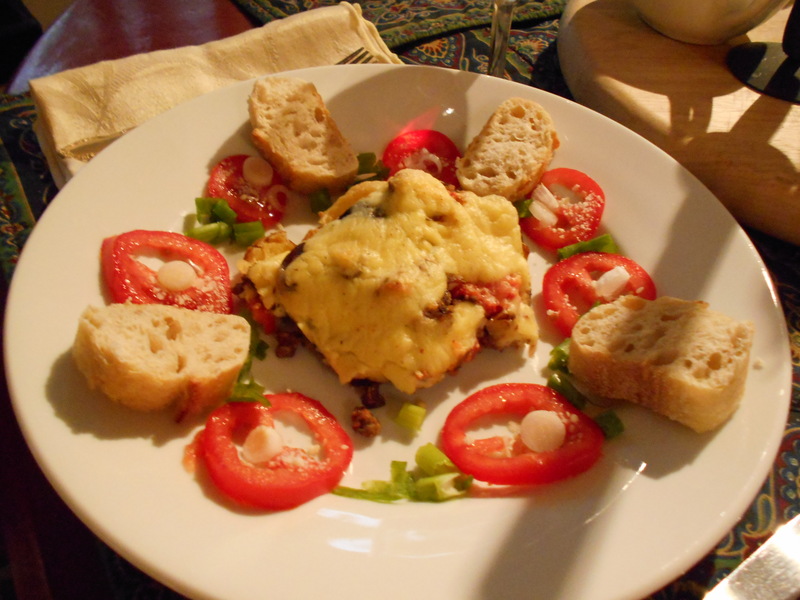 Be sure to take a minute to visit Margot’s blog http://blog.tempinnkeeper.com for over 200 more simple and delicious recipes. You also can call Margot for personal cooking help or hosting for small B&B kinds of food gatherings. Margot’s phone number is: 208-721-3551. Friend Margot on Facebook and also find her on Linkedin,Twitter,Pinterest and other social sites. 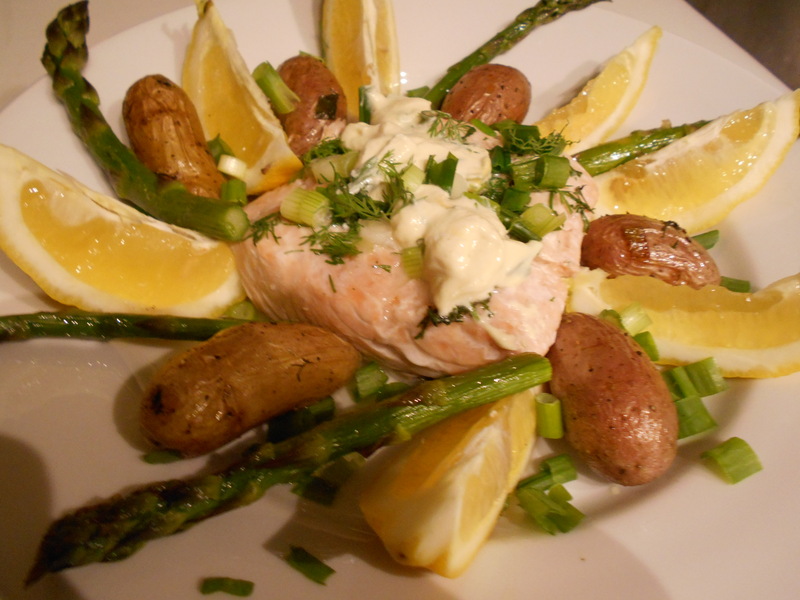 Did your poached salmon with my Copper river salmon. It was outstanding !!! This is such a healthy and easy dish to make. You can really use any kind of vegetables (even frozen though I love the fresh variety) that you wish so almost every ingredient mentioned here is optional. You also can add rice or pasta along with the chick peas; or you can use white beans instead of the chick peas. You can omit the meatballs and use ingredient combinations like pasta or rice plus beans to make a complete protein. (Look online to find the food combinations that make a complete protein.) You can use chicken or vegetable stock instead of beef stock. You can change the Italian slant of this dish a make instead a Mexican one (add enchilada sauce and tortillas) or German (add slice bratwurst) or Indian (add curry seasoning and Nan) or—well I leave it up to you. Just use your imagination and it’ll come out superb and healthy. It’s also a very economical dish and can be served for lunch or dinner; and why not serve it for a very healthy and filling breakfast? Lastly, for the busy ones, if you have a slow cooker, you can cook it in there (5-6 hours on low), leave home and come back to an almost cooked meal. You just have to add the last half hour ingredients when you are home. I love dishes like and this and it’s one that the whole family can participate in—including of course the kids. Add the ingredients numbering 4 through 10 and cook gently, stirring from time to time, for about 15 minutes. Add the ingredients numbering from 11 to 15, bring to a boil, turn down to a simmer, cover and cook for 1 ½ hours. Add the ingredients numbering from 16 to 18 for one more 1/2 hour. Serve over the optional French bread and/or topped with the shaved Parmesan and chopped parsley. Mix everything together till not too soppy and form into one-inch diameter meatballs.